These Grilled Hawaiian Chicken Teriyaki Bowls could be my all-time FAVORITE summer meal! 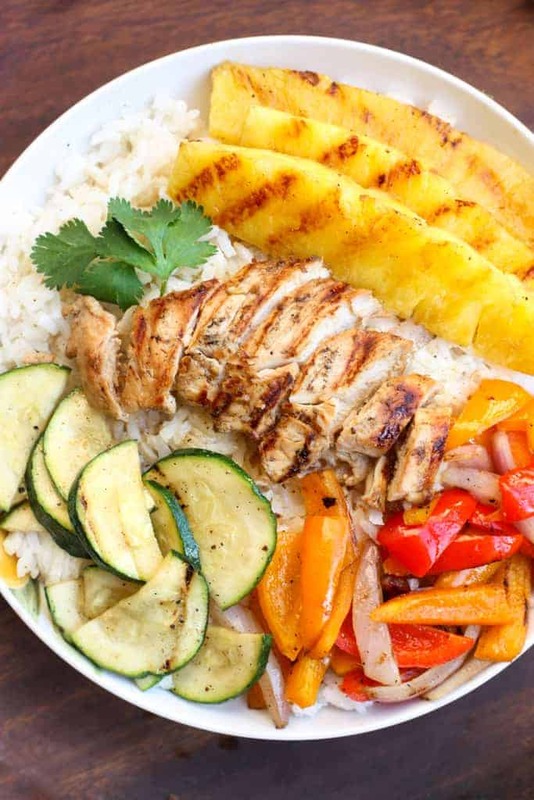 The bowls start with a layer of coconut rice, topped with grilled pineapple, zucchini, bell peppers, and onions. Then, we add grilled teriyaki chicken and an extra drizzle of homemade teriyaki sauce over the top of everything. This amazing rice bowl is sure to be your new favorite dinner! This is one of those meals I could eat EVERY NIGHT of the summer! Most of the ingredients are cooked on the grill, and lets face it, nothing tastes better during the summer than food fresh off the grill, and there’s less of a mess to clean up after. Whether it’s kebabs, steak, fruit, or even these amazing grilled doughnuts, that smokey/charred grill flavor just can’t be beat! There are so many things to love about this recipe, but one of my favorites is the Grilled Pineapple. 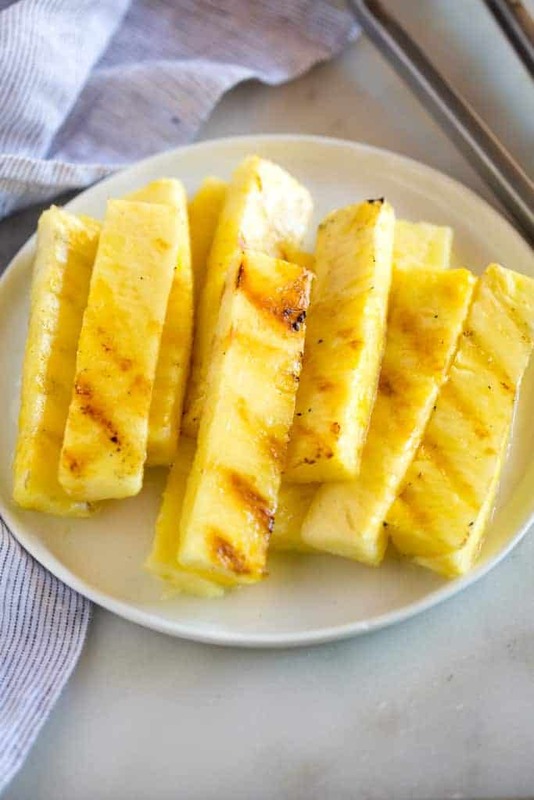 To make grilled pineapple, simply cut a fresh pineapple into spear, smooth a little bit of olive oil over them, and cook the spears on a hot grill, for a few minutes on each side. The grilled pineapple pairs perfectly with the coconut and teriyaki flavors in this dish. Another element of this recipe I LOVE is the easy homemade teriyaki sauce and the coconut rice. I rarely have bottled teriyaki sauce on hand, but I usually always have the ingredients I need to make this teriyaki sauce from scratch. It’s comes together in just a few minutes, and tastes so much better than store bought! I hope you enjoy these summer rice bowls as much as we do. A little bit of sweet, a little bit of smokey, and tangy–put each tasty ingredient together and you’ve created pure magic! Can I substitute brown rice? Yes! To substitute brown rice for the white rice, add an extra 1/4 cup of water, simmer for 45-50 minutes or until liquid evaporates. Remove from heat and leave covered for 10 minutes, and then fluff with a fork. You could also substitute another grain, or quinoa if you’re gluten free. 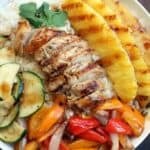 Grilled Hawaiian Chicken Teriyaki Bowls with coconut rice, zucchini squash, bell peppers, onions, and pineapple topped with a delicious teriyaki sauce! Add the water, coconut milk, sugar, and salt to a large saucepan. Bring to a boil, then stir in rice. Return to a boil. Reduce heat to low, cover and cook for 20 minutes. Remove from heat and let stand, covered, 10 minutes, before fluffing with a fork. Make the teriyaki sauce by adding all of the sauce ingredients to a small saucepan over medium heat. Bring to a boil, stirring constantly, and boil for about 1 minute. The sauce should be thick enough to coat the back of the spoon. Pour 1/4 cup of the teriyaki sauce over the raw chicken and set aside to marinate for at least 15 minutes (or longer if using chicken breasts). Prepare your grill and heat it to medium. If you have a vegetable grill basket to grill the vegetables in, then chop them and grill them in the basket. If not, cut the vegetables into large pieces that will not fall through the grill grates. Drizzle some olive oil over the vegetables and over the pineapple spears. Grill the vegetables for just a few minutes on each side and then remove to a plate. Grill the pineapple next by placing the pineapple spears directly on the grill. Grill for about 2 minutes on each side, and remove to a plate. Lastly, place the chicken on the grill. Cook for about a few minutes on each side, or until cooked through. Remove to a plate to rest before slicing. Add coconut rice to each serving bowl. 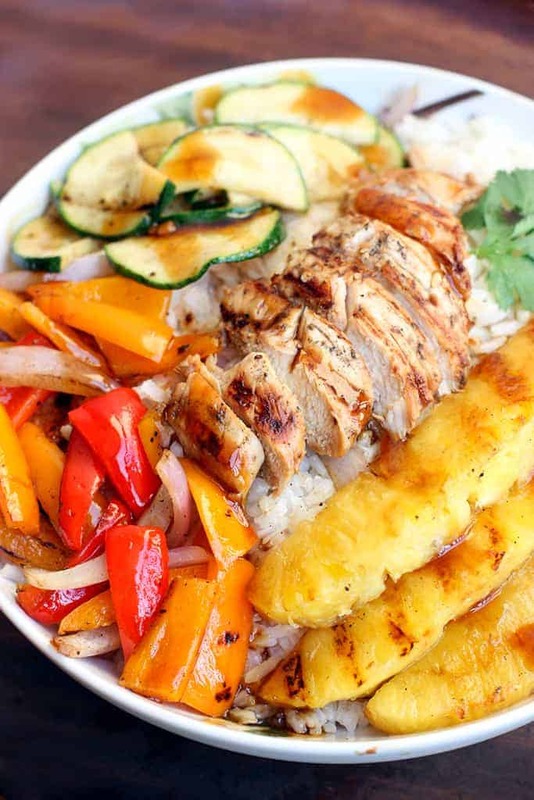 Top with grilled veggies, pineapple and chicken. Drizzle a little of the remaining teriyaki sauce on top. You might also love Honey-Lime Chipotle Chicken Fajita Bowls! Made this for dinner… It was the perfect summer meal!!! Family loved it. I feel terrible for not having commented on here, because I’ve been making this for years and shared with lots of people- one of my favorite meals for sure!! So flavorful, healthy, and everyone loves it. Thank you!! The hubby and I love this recipe! Lots of flavor and you can substitute any veggie you want. The teriyaki sauce is delicious! I’ve used it for other recipes. Thank you for the recipe! Tried this last night, and it was AMAZING!! Only changes are I would make more chicken because the pack of tenders we used went fast. The rice was excellent, and I’m no fan of coconut, so that says something. Also not a big fan of zucchini, but grilled and with the teriyaki drizzled on the final plate, it was delicious. I’m ready to make this a weekly dish, and can’t wait to share it with others. This is the 4th recipe of yours I’ve tried, and so far, every one of them has been great. Keep up the good work! Thank you Jon–I’m very happy to hear you have been enjoying some of my recipes! Thanks for your comment. This has easily become a family favorite. And I’m making it now.. in October ? thanks for sharing!! Hey LAUREN ALLEN thanks for recipe but will you please tell me should i use oil instead of water for making coconut? Hi Mickey, could you clarify your question? Oil instead of water for what? I have very few recipes in my “Tried, True and Good” Section. This was the first and is still the most often made. Whenever I am missing Hawaii, I make this for my soul and my kids love it too! These chicken bowls are amazing! Delicious and every bit as good as any I’ve had a restaurant! Whenever I want to try a new recipe I come to your website and I’m never disappointed! That’s such a nice compliment–thank you Lisa! Can you substitute brown rice in this? Sure, but you will want a little more liquid (about 1/4 cup) and cook for 45 minutes. Allow to rest for 15 minutes before removing the lid!